Former Pompey striker Peter Crouch has admitted to paying the club's legendary kitman ‘sixty quid a week’ to do his washing for him. The ex-England international played 37 times for Portsmouth during the 2001-02 season. And Crouch has been looking back at his time on the South Coast in his new BBC 5 Live podcast. That Peter Crouch Podcast features the goal machine reflecting on his career as a professional footballer - alongside Tom Fordyce and Chris Stark. It debuted last week and he made the claim that he ‘invented Come Dine With Me’ while playing for Pompey. In the latest episode, Crouch and his co-hosts discussed kitmen at football clubs, including Pompey’s legendary Kev the kitman. He said: ‘We had one at Portsmouth who was a character, Kev. He was an ex-boxer from Wales and he was brilliant. 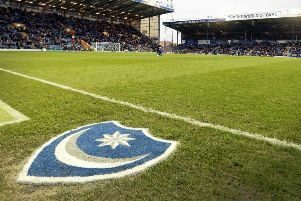 ‘At Portsmouth we weren't well off at that stage, the club, and we had to wash our own kit, that was in the early days. He would charge us. ‘I was a single lad on my own and hadn’t worked a washing machine in my life. So I used to give him the kit and give him sixty quid to wash it a week, I think. ‘Big’ Kev McCormack has been Pompey’s kitman since 1998 and earlier this summer some of the first team squad had to box him during the pre-season tour of Ireland. Kev, a former heavy-weight boxer, is a three-time ABA champion and was the flag-bearer for Wales at the 1994 Commonwealth Games. Dion Donohue, Tom Naylor, Louis Dennis, Oli Hawkins and Christian Burgess were the unlucky players who had to box Kev after losing a football tennis tournament.